Peel shrimp. Make a shallow cut lengthwise down back of each shrimp; wash out vein. In 12-inch skillet or 4-quart Dutch oven, melt butter over medium-high heat. Add onion; cook, stirring frequently, until tender. Reduce heat to medium. Add shrimp; cook uncovered about 8 minutes, turning once, until shrimp are pink. Remove shrimp from skillet; keep warm. Add champagne to onion in skillet; cook until liquid has evaporated. Stir in rice. Cook uncovered over medium heat about 5 minutes, stirring frequently, until edges of rice kernels are translucent. In 4-cup glass measuring cup, mix chicken broth and clam juice; pour 1/2 cup mixture over rice. Cook uncovered, stirring occasionally, until liquid is absorbed. Repeat with remaining broth mixture, 1/2 cup at a time, until rice is tender and creamy. About 5 minutes before risotto is done, stir in shrimp, arugula, cheese and pepper. Sprinkle with parsley before serving. Even though you may be tempted, don’t rush the process! 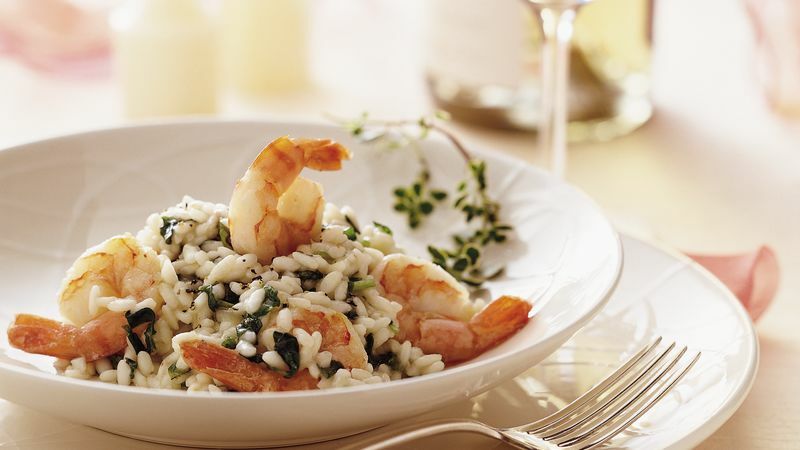 When making risotto, adding the broth a little at a time ensures that the dish will be creamy while allowing the grains to remain separate.Leave out the shrimp and serve this as a lovely main course for your vegetarian friends. Next PostNext What Do You Think is the Most Asked Question I Get?